One of the saddest jobs on any Second World War bomber squadron must have been filling in the logbooks of those who didn’t return from operations. 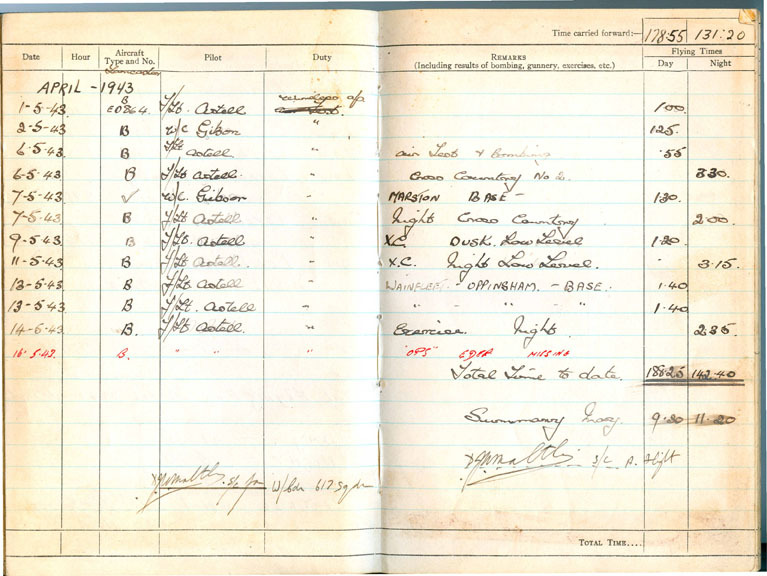 Here, courtesy of his nephew Hartley Garshowitz, is the last page of Wt Off Albert Garshowitz’s logbook from May 1943. Garshowitz was the wireless operator in Flt Lt Astell’s Lancaster AJ-B, which collided with a pylon on the outward flight to the Möhne Dam. Garshowitz appears to have done all the totalising of hours himself before he took off on the Dams Raid. The entry in red, in someone else’s handwriting after the raid, says ‘”Ops” Eder missing’, when his aircraft was actually tasked with attacking the Möhne. The spaces left for signature by the Flight Commander and the Squadron CO have both been completed by David Maltby, who became Commander of A Flight after the raid. Gibson was obviously not available when this book (one of 53 altogether) was presented for inspection. There is more about Albert Garshowitz and his good friend Frank Garbas, front gunner in AJ-B, in this entry on the Canadian Bomber Command Museum website. Another example, this time from the Daily Mail. The last of the Dambusters has spoken for the first time how he celebrated the squadron’s heroic raid – with a nice cup of tea. 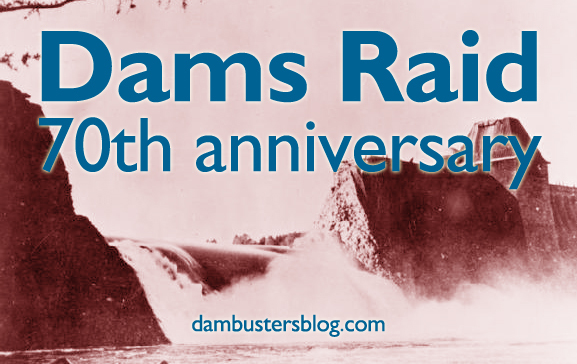 I’m happy to say that there are three Dambusters still with us: George ‘Johnny’ Johnson in England, Les Munro in New Zealand and Fred Sutherland in Canada. George Johnson has told his story a number of times. Almost 70 years after the night-time bombing attacks, Squadron Leader George ‘Johnny’ Johnson, 91, told of the daring raid over occupied territory that dealt a decisive blow that crippled the Nazi war effort. George was festooned with a raft of medals including a Distinguished Flying Medal for his part in 617 Squadron’s daring 1943 blitz on the Nazi-controlled dams along the Ruhr Valley in Germany, destroying their hydro-electric source of power. George’s ‘raft of medals’ are for his war service as a whole. He was awarded the DFM for his part in the attack on the Sorpe Dam. The concept of any one airman getting more than one decoration for a single operation is ridiculous. It did occasionally happen that an airman got more than one decoration for an operation, but it was very rare (see comment below). Widower George, who lives in Bristol, was a sergeant at the time of the raids, conducted under the name Operation Chastise, which smashed the Mohne, Sorpe and Eder dams. He said: ‘We were about half an hour late because our plane had a hydraulic leak and we had to swap. The Sorpe Dam was attacked, but remained intact. It was not ‘smashed’. ‘We took off at 22.01, and flew in over Sorpe dam in brilliant moonlight. We had to get the aim right – we went in six or seven times and I’d shout ‘Dummy Run’. Piloted by Joe McCarthy, the plane nicknamed ‘T for Tommy’ was one of five planes that made it to the dam, which was the most difficult of the three targets to crack. Three aircraft made it to the Sorpe Dam. Only two aircraft bombed the Sorpe Dam (see comment below). T for Tommy was not a nickname for the aircraft piloted by Joe McCarthy. It was its call sign. It took bombardier George and his crew nine attempts to fly at a perilous 30ft, before the bomb, codenamed Upkeep, was finally loosed, seconds before they had to pull up to avoid smashing into the hillside behind the dam. Bombardier is an American term for what the RAF called ‘air bombers’ early in the war. 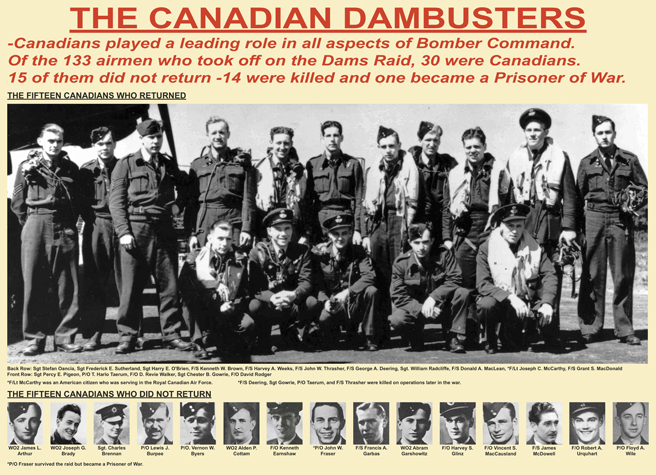 By 1943 they were usually referred to as ‘bomb aimers’. He said: ‘I could see where to drop and shouted ‘Bomb Gone’ to cheers of ‘Thank Christ’ from the crew who were yelling for me to get the bomb out. George added: ‘There was a spout of water 1,000ft high. We circled and the dam crumbled about 10 yards wide. After smashing the dam, the heroic airmen flew their Lancaster bomber over the Mohne Dam, which had been blown by another plane in the same daring raid. The Sorpe dam was badly damaged by the daring night-time raid, orchestrated by wing commander Guy Gibson and bouncing bomb inventor Barnes Wallace. Some confusion in the last two paragraphs here. Was the dam ‘smashed’ or ‘badly damaged’? Oh, and it’s Barnes Wallis, not Wallace. George said: ‘I will never forget the sight. It was like an inland sea with all that water overflowing. It was only when they flew back to RAF Scrapton in Lincolnshire that the brave crew realised they had been hit several times by an armoured train on their way to the dams, and the pilot’s chair was pockmarked with bullet holes. The five-hour raid came at a heavy price – 53 of the 133 brave airmen, hand-picked for the secret mission, did not come home. The brave airman married sweetheart Gwyn, a phone operator in the Women’s Royal Air Force, days before the sortie, after being given special permission from chiefs despite all leave being cancelled. After narrowly avoiding death on an eye-watering 50 missions during his 22 years’ service with the RAF, George became a teacher. Did the Second World War really last 22 years? George’s ‘eye-watering 50 missions’ were of course confined to his war time service between 1940 and 1945. He stayed on in the RAF until 1962, and rose to the rank of Squadron Leader. Great-grandfather George, who became a widower when Gwyn died of cancer in 2005, is helping Lord of the Rings filmmaker Peter Jackson with his scheduled remake of the classic 1955 Dam Busters film. He said: ‘I feel honoured and proud to have been lucky enough to take part in that raid. 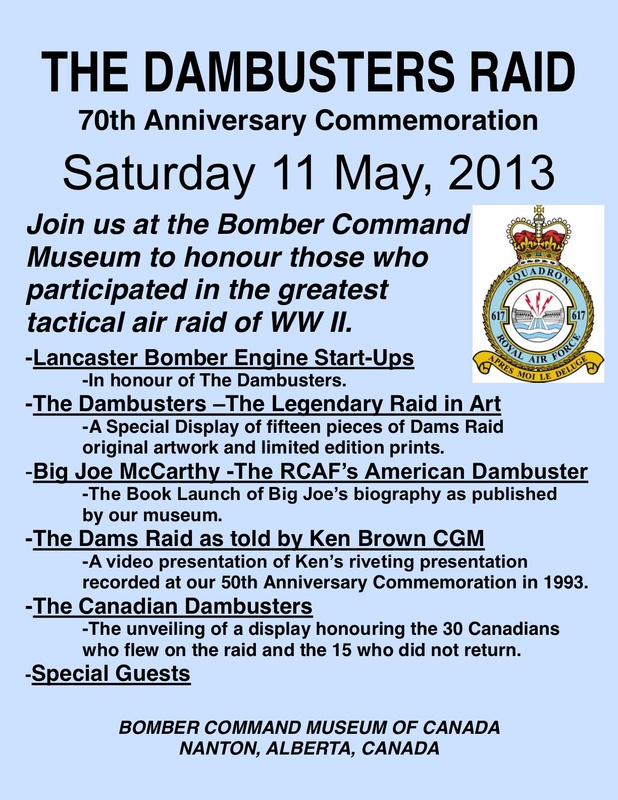 Below is a list of the events so far planned for the 70th anniversary of the Dams Raid. Please note that many are still subject to confirmation, especially the flyover at the Derwent Reservoir on Thursday 16 May. This list will now be updated regularly, and you will be able to see the latest version by clicking on the category Dambusters 70th anniversary below. 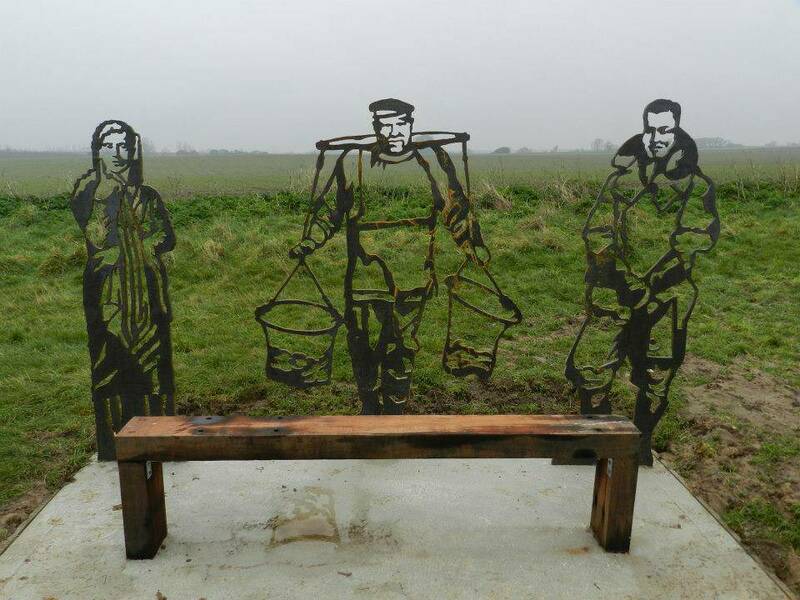 If you fancy a walk along part of the Oyster Bay Trail, on the North Kent coast, why not relax for a moment or too on the new portrait bench just outside Reculver? It’s the brainchild of Canterbury City Council, who allowed the public to choose the three images who would represent the area’s culture and history. The winners were (from left to right) a woman in Roman dress, an oyster fisherman, and Dambuster pilot Warner (“Bill”) Ottley, who flew AJ-C on the Dams Raid and was shot down near Hamm. Bill Ottley’s family lived in Herne Bay, which is the local connection to the portrait bench. Although he was only 20, he had already completed a tour of operations in 207 Squadron, and been recommended for a DFC. The picture of Ottley on which this bench portrait is based was supplied to the council by Alex Bateman, long time friend of this blog. If you are quick, you can enter a draw to win £250 simply by taking a photo of someone on the bench and sending it to Canterbury City Council. Closing date 31 March! Retired RAF officers all over the country will have been harrumphing into their cornflakes this morning as yet more evidence of the decline of editorial standards in the national press is presented. 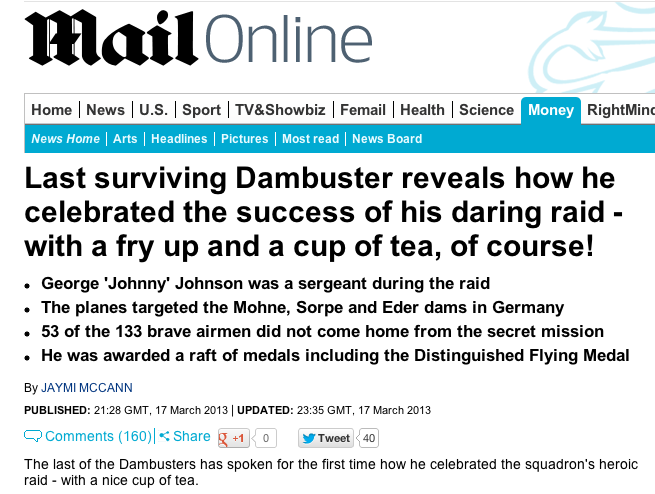 This time it’s at the Daily Telegraph, a paper which once employed a real life Air Commodore as its Air Correspondent. To illustrate a story about the continued role of 617 Squadron , it chose a picture which purports to show three “Dambusters”. 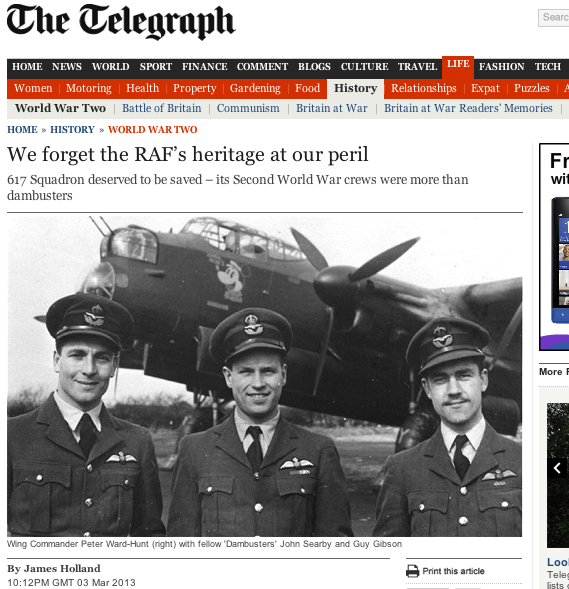 Unfortunately, only one of them actually served in 617 Squadron – Guy Gibson, in the centre of the trio above. On the right is Peter Ward-Hunt, who had a distinguished career as a bomber pilot in a number of squadrons, and whose obituary was in the Telegraph when he died in 2005. On the left is John Searby, who took over from Gibson as CO of 106 Squadron.